Call it sowing the seeds of a new idea. Budding writers in UBC's Okanagan campus Dept. of Creative Studies are blending plant metaphors with plant science to discover their emerging literary voice. It takes fertile imagination and plenty of spadework: using live plants, text, art objects, experiments that explore art and science, and integrating references of n’syilxcen, the Okanagan native language, and non-humanities research in a live presentation called the Plant Intelligence Project. Creative writing lecturer Sonnet L'Abbé says the project is inspired by the growing reputation of UBC and the Okanagan's status as among the best places in Canada for eco art, combined with scientific evidence that plants behave in oddly intelligent ways. For instance, it has been proven that plants fight predators, maximize food opportunities, and partner with other organisms to share resources. John Klironomos, a biology professor in the Irving K. Barber School of Arts and Sciences, told CBC that an estimated 90 per cent of plants have recognition and associative tendencies. "Having been exposed to evidence for arguing plant intelligence, the project assignment is to create a work of environmental art that engages that question," says L'Abbé. "Students are free to create any suggestion of plant intelligence or plant communications they wish and reference any kind of plant research." L’Abbé hopes to see students take the idea of plant consciousness or sentience seriously. Art and science can inform each other and it’s not a question that one is better than the other, says L’Abbé. 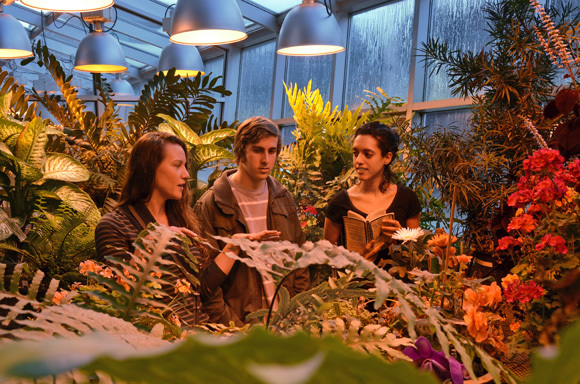 Student group presentations of The Plant Intelligence Project take place in the foyer of the Charles E. Fipke Centre for Innovative Research, Thursday March 7, from 11 a.m. to noon. The event is part of UBC’s Celebrate Research Week activities. Admission is free and open to everyone. To support their research, L'Abbé's students attended a guest lecture with Prof. Susan Murch to better understand plant science and apply it to literary endeavour. Murch's science students will, in turn, view the presentations and give feedback. Murch, Canada Research Chair in Natural Products Chemistry, is fascinated by the research and teaching approach of the Plant Intelligence Project. "As scientists, we frequently think that we know what we are talking about and that there is one ‘right’ answer to be found,” she says. Kate Ball, a fourth-year psychology student taking a minor in creative writing, says she is excited about the Plant Intelligence Project and what she hopes to discover. “It’s worth it for creative writing students to go beyond their comfort zone, expand their knowledge base by engaging plants and plant science in their writing,” she says. Ball’s group project consists of a board containing various Okanagan native plants and poetry text surrounding the perimeter. A spider plant in the middle will be photographed daily to see how it responds to the other plants. The Plant Intelligence Project is presented in collaboration with the Eco-Art Incubator and Prof. Susan Murch. Creative writing students Kate Ball and Hayden McIntosh discuss the Plant Intelligence Project with instructor Sonnet L’Abbé (right). 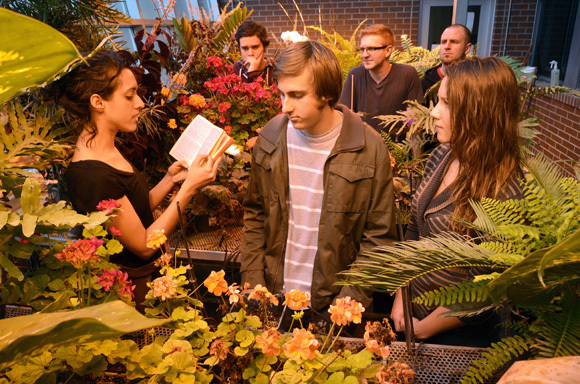 Creative writing instructor Sonnet L’Abbé (left) delivers inspiration about the Plant Intelligence Project to students (from left) Cole Mash, Hayden McIntosh, Joe Dermo, Cory Wiemken and Kate Ball.